On the second day of Queen Maxima's visit to India, the Queen met with External affairs minister Sushma Swaraj at the building of Ministry of Foreign Affairs. Leaders talked about growing financial inclusion in India. Afterwards, Queen Maxima of The Netherlands came to Mumbai city of India. Queen Maxima is ceremonially welcomed upon her arrival at the Taj Mahal Palace Hotel in Mumbai, India. Queen Maxima will visit the Mumbai Dabbawalas at Andheri railway station. ik ben trots op onze prinses!!!! Prinses??? Koningin zul je bedoelen. Nonsens..there are tall people and short people. Does it matter? Is it important? It is not hugely important; it is simply an observation that choosing shoes which make her look even taller was unnecessary and perhaps should have been avoided. The degree to which she towers over the other lady in these photos frankly looks comical, if not somewhat grotesque -- which is unfortunate because to the casual onlooker it takes attention away from the purpose of their meeting. Totally agree, the obvious drastic height difference takes the attention away from the real purpose. There are days when it would be appropriate for Maxima to wear flat shoes. I have been thinking about that before, but here it is striking, platform shoes?! I completely agree. 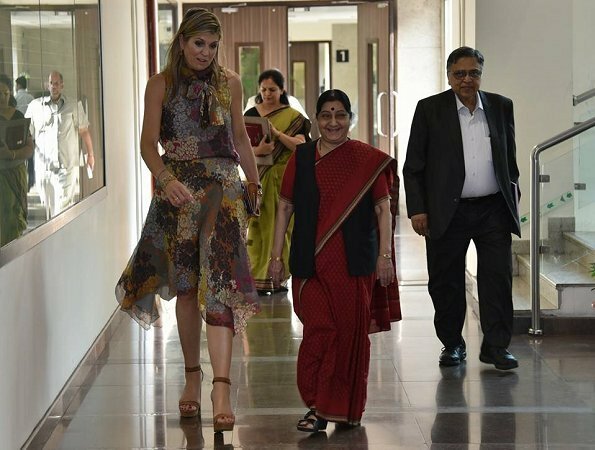 She may not have been aware of Mrs. Swaraj's height, but by the time of this meeting she certainly would have noticed that she towers over most of the dignitaries who have met with her in India. Surely it would have been thoughtful and considerate to avoid making herself look even taller! Queen Maxima is well-named! I agree, lower shoes would help all feel more comfortable. Her dress is a lovely print and I hope it is breathable silk, especially with the high neckline. It looks like the climate is taking its toll on her hair and makeup. Actually I feel sorry for her having to cope with that plus probably losing sleep with all of the recent travel. Nice spring dress and yes flats would have been better. Do not like the belt, it looks oddly placed and almost looks like maternity wear. I do like the colors and it looks fab on Max. No complaints with her shoes, in other pics she looks taller than the other ladies, she just towers over M. Swaraj. There is a nasty surgeon at the hospital where I work, at 6' tall I tower over him and I use it to my full advantage when he starts up. It is nice to walk up to him, look down at him and say "what's your problem" Tall girls rule!! Short ones too!!! Queen Maxima looks very beautiful. Hmmm... wonder why women are expected to ponder such vagaries. I’d like to think Mrs Swaraj was not bothered by such rubbish that she lost sight of why they’d all gathered there. Maxima needs to learn to keep her knees together when she's sitting down. She showed poor judgment wearing high heels for this event, it made her look like a giantess. Her hair, as usual, is a mess.